On Monday, I gave you a peak at what was the beginnings of a new sewing machine cover. What I didn't show you was the sewing machine cover that came with the machine. It's plastic and ugly, but it served as a perfect pattern and supplied inserts for my new sewing machine. I created inserts on the inside of the new sewing machine cover to allow the plactic sides to slide right in. It worked out perfectly to give the new sewing machine cover shape and stability. The back is rather plain at the moment. I plan on hand-appliqueing something onto the back, but I haven't decided what. Does anyone have any ideas? I would love any creative (and appropriate) suggestions. It's lovely. You're very clever to have made this. I was thinking you could put your name on the back. 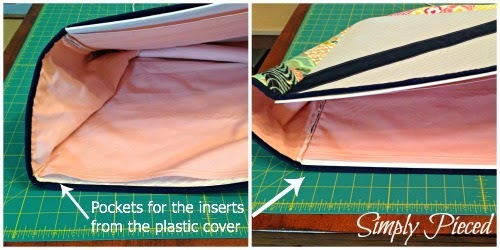 What a great idea to use that plain cover as the template and insert for your snazzy new cover! It looks fantastic! How about a spool block for an applique? I would probably apply hexis to the back...boring (or at least not original) but pretty. I love your new cover! Brilliant! I may have to do this! Looks fabulous. Clever idea to use the old cover for inserts on the new. This looks so good and how smart to use the plastic cover to create something so beautiful! Beautiful and functional. Love that! love the idea of putting your blog name on there -- or your machine's name on there. but how about something fun like -- "sewing / quilting is always the answer"
Fun project and looks fabulous! I love that you re-purposed the plastic cover. Your piecing is great. Thanks for sharing your process. This is my favorite machine cover ever! Love it! My (used) Juki came with a cover like that, but it was pretty beat up and I am not sure what I did with it - will look now since this was such a great idea. Simply Pieced would be sweet on the back! This is amazing! What a gorgeous sewing machine cover. Wow, that looks amazing! I have a cover similar to it as well. Just might have to try this as well. I also like the idea of having your blog name appliqued on the back. no wonder it came out so perfectly shaped! you may have convinced me to redo mine. maybe. =) it's fabulous, janet! Much, much nicer than the plastic one!! Could you explain further how you inserted the pockets for the plastic inserts? I would love to make a like cover for my new Juki! I used the plastic insert as a template and made it 1/2 inch bigger all the way around. I quilting the top directly onto the batting. The pink fabric that is the lining is only attached at the seams along the side and top. This allowed for the pocket to form. I hope that was helpful. This is beautiful and functional too! Thanks for sharing! What a brainiac idea to use the plastic cover!